For so many Christians, frustration and fatigue set in as they try time and again to get free from what holds them back. God never intended for it to be this way. He destined you to be victorious in every area of your life, and more than that, He gives you the power to overcome whatever comes against you. 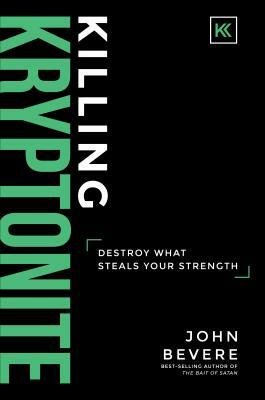 In his new book Killing Kryptonite, best-selling author John Bevere opens up about his own story, revealing key biblical truths that moved him from a life of struggle to a life of breakthrough. You can enjoy a life of intimacy and connection with God. You can have a vibrant, powerful faith that impacts the world around you. But first, you have to face off with spiritual kryptonite. This book is not for the faint of heart. But if you’re ready to embrace a journey of radical transformation, this message is for you. Are you ready to kill your kryptonite and step into the life you were born for? JOHN BEVERE is an international speaker and bestselling author known for his bold and uncompromising approach to God’s Word. John and his wife, Lisa, are the founders of Messenger International—a ministry committed to developing uncompromising followers of Christ who transform our world. When he’s home in Colorado, you can find John playing competitive card games with his four sons or trying to convince Lisa to take up golf.